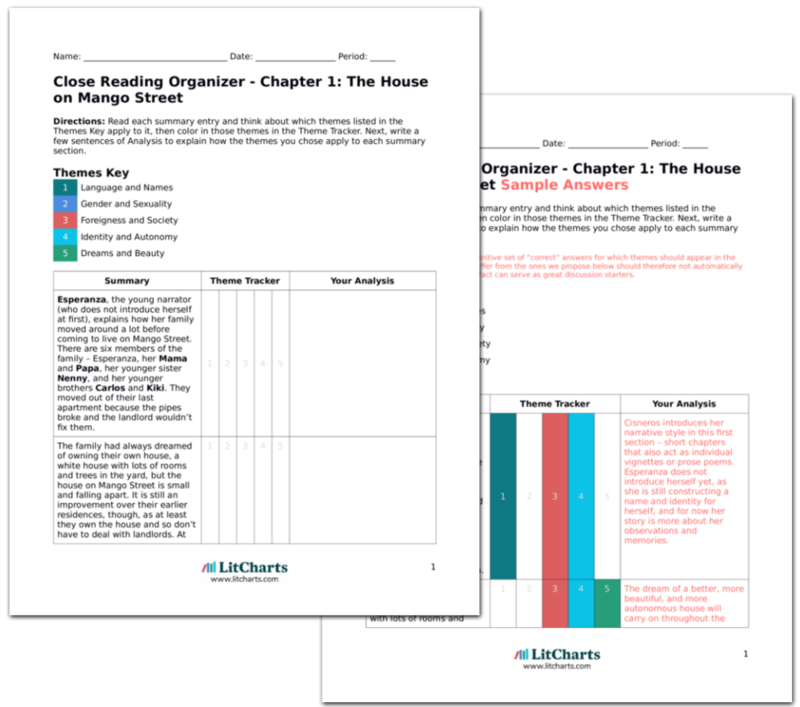 Instant downloads of all 945 LitChart PDFs (including The House on Mango Street). Esperanza, the young narrator (who does not introduce herself at first), explains how her family moved around a lot before coming to live on Mango Street. There are six members of the family – Esperanza, her Mama and Papa, her younger sister Nenny, and her younger brothers Carlos and Kiki. They moved out of their last apartment because the pipes broke and the landlord wouldn’t fix them. Cisneros introduces her narrative style in this first section – short chapters that also act as individual vignettes or prose poems. Esperanza does not introduce herself yet, as she is still constructing a name and identity for herself, and for now her story is more about her observations and memories. The family had always dreamed of owning their own house, a white house with lots of rooms and trees in the yard, but the house on Mango Street is small and falling apart. It is still an improvement over their earlier residences, though, as at least they own the house and so don’t have to deal with landlords. At their old apartment a nun from Esperanza’s school had seen Esperanza playing out front and made her feel ashamed of where she lived. The dream of a better, more beautiful, and more autonomous house will carry on throughout the book – Esperanza and her family and neighbors are always hoping and dreaming of something better. The nun’s comment is the first example of society shaming Esperanza for her race and class. Esperanza’s parents assure her that the house on Mango Street is only temporary, but Esperanza doubts their word. She still clings to the dream of having her own house, one she can be proud of, and she remains dissatisfied with the house on Mango Street. Part of Esperanza clinging to the dream of her own house involves feeling like she doesn’t belong on Mango Street. For now she will purposefully try to keep this neighborhood out of her identity. Cosby, Matt. "The House on Mango Street Chapter 1: The House on Mango Street." LitCharts. LitCharts LLC, 22 Jan 2014. Web. 23 Apr 2019. Cosby, Matt. "The House on Mango Street Chapter 1: The House on Mango Street." LitCharts LLC, January 22, 2014. 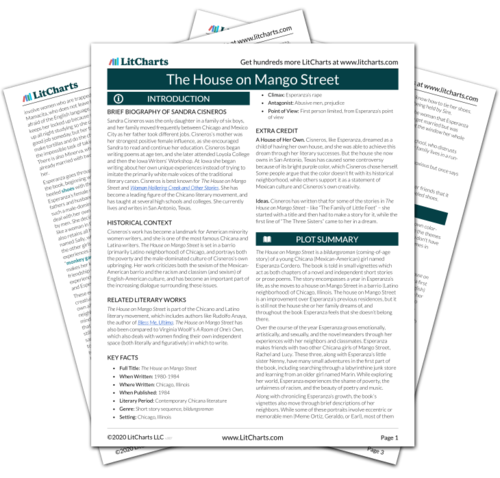 Retrieved April 23, 2019. https://www.litcharts.com/lit/the-house-on-mango-street/chapter-1-the-house-on-mango-street.